First, there is the conscious mind or active mind. This part of the mind has been explained in many different ways by many different people over the ages. I could make up some intriguing definition, but I will just say it is where you experience and interact with the world around you. Second, there is the subconscious mind or mysterious mind. This is the part of the mind few of us really understand. We may know it keeps our heart beating and the rest of our bodily functions working without any conscious thought. We may even understand it as the storehouse of our lifetime of experiences. But do you really understand how you can talk to your subconscious mind and ask it to help you live the life you desire? Advertisers, parents, teachers, preachers, bosses, the media and much more are communicating to your subconscious mind with messages they want you receive. These messages may be beneficial to you: “Don’t touch the hot stove”. These messages may someday hinder you: “Don’t talk to strangers”. The simple fact is that who you are today is the sum of all the messages that you have allowed to reach your subconscious mind. The good news is that your subconscious can easily have an armed guard on duty to protect it from messages that may not contribute to the life you want to be living. This trained guard is the conscious mind. And it is your responsibility to call this guard to duty. Make sure your conscious mind is on active patrol for negative or conflicting messages. This guard should be allowed no coffee and doughnut breaks. It should be ever vigilant to protect your subconscious from garbage, conflicting messages and other hype. Although it is important to keep the garbage out of your subconscious, the wonders start to unfold when you place your life’s goals into your subconscious mind. The most effective method to communicate with your mysterious mind is to read to your subconscious mind, out load and with enthusiasm. To take this even further, you should consider reading it your goals and plans written in your own handwriting. You may be thinking “This sounds silly. I am to read my handwritten goals out loud AND with enthusiasm?” Yes! This is effective because your subconscious mind delights at hearing your voice and finds your handwriting powerful and persuasive. Your mysterious mind trusts you above all others and recognizes your instruction through your spoken and written words. So start this habit today. Do not let another day pass. 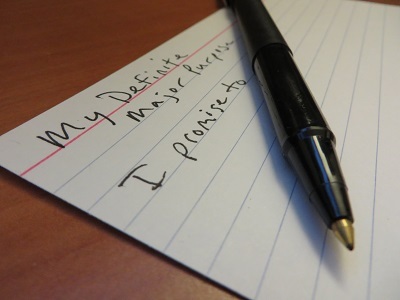 Write out your major purpose in life on a piece of paper and carry it with you. At least three times a day, read the statement dramatically aloud, filled with emotion and energy. I have found this practice to keep me focused and excited to complete the tasks needed to move forward toward my goals. More intriguing, some solutions appear with little or no effort from me and my conscious mind. It seems as if my subconscious is somehow helping me expeditiously accomplish my goals. No wonder some people refer to the subconscious mind as the mysterious mind. « Master Key Week 1: Where Am I Going From Here? Thank you for sharing your thoughts on the mysterious mind. I am finding truth in my life as you have stated. These are great insights. Keep strong on the habits and the possibilities are endless. The subconscious mind is the horse and the conscious mind is the rider. The horse knows the way but does not communicate that to the rider thus when the horse makes a sharp turn the rider falls off. However, the rider is the one in charge of the horse so the rider must take control of the reins and steer the horse in the direction in which the rider wants to go. Yes, the horse can be stubborn but with persistence the horse will follow the new path and direction the rider wants her/him to go. Ride a horse save a cowgirl/cowboy. This was an anomaly I learned at a Jack Canfield conference. You laid it out well. Wish someone would have told me these things years ago. Master Key Week 9: Is Your Mind Full of Weeds? Master Key Week 7: Do Vacations Make You Work Faster? Master Key Week 6: Are You Behaving Like a 90-Year-Old?